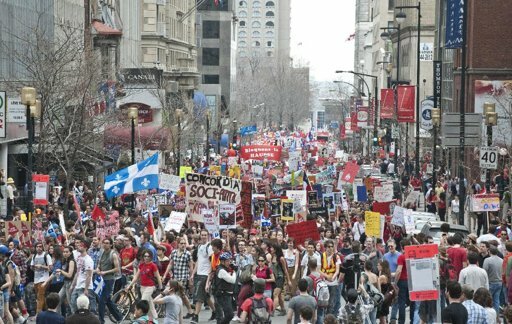 Tens of thousands of students protested on Thursday against a 75 percent tuition hike at universities in Canada’s mostly French-speaking Quebec province, bringing downtown Montreal to a standstill. Since mid-February, nearly 300,000 students have boycotted classes, blocked bridges and held smaller protests around the province. More than 1,000 indigenous protesters reached Ecuador’s capital Thursday after a two-week march from the Amazon to oppose plans for large-scale mining on their lands. The protesters were joined by thousands of anti-government protesters in Quito. Hundreds of farmers gathered in the Vietnamese capital on Thursday to demand the return of rice fields they say were confiscated by heavily armed police just days after receiving an eviction notice. More than 1,000 people gathered in a downtown Brattleboro park on Thursday to call for the closure of the Vermont Yankee nuclear power plant. It was the first day of the plant’s operation after the expiration of its 40-year license. Over 130 protesters were arrested for unlawful trespass as part of a civil disobedience action. More than a thousand people rallied in New York City’s Union Square on Wednesday evening with the parents of Trayvon Martin, an unarmed teenager who was shot dead in Florida in late February. Portuguese workers halted trains, shut ports and paralyzed most public transport in the capital Lisbon on Thursday to protest austerity measures and labor reforms imposed as a condition of a 78-billion-euro ($103 billion) bailout. Three Tibetans who have been on hunger strike outside the UN headquarters for the past month ended their protest Thursday after the UN said investigators would look into events in Tibet. Several people were arrested on Tuesday after a rally in a Phoenix intersection to protest immigration policies of Maricopa County Sheriff Joe Arpaio.